Blurb: Historical fiction meets urban fantasy in a spine-chilling tale of mystery and murder. Review: I was worried about this book. I sometimes struggle with historical fantasy because it can come off sounding so... forced. I feel like the author is trying really hard to make us believe we've gone back in time. Michelle Zink doesn't have this problem. Her ability to create a realistic historical setting is brilliant. I was able to forget that I was in a different time and really enjoy the story. I also loved the mood Zink created. The whole time I was reading I felt eerie, like someone was watching me. It was really spooky! I loved the relationship between Lia and Alice, and it still gives me shivers to think about it. 1. Too many questions, not enough answers. I felt like there were A LOT of questions in this book, and even though most of them were answered they were answered in these really vague ways. Either in Latin, or in a poem, or in some mysterious voice on the wind. You get the idea. Instead of creating a feel of mystery, this just confused me. 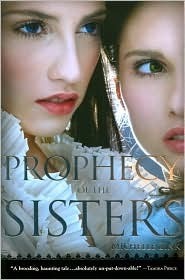 I'm still not entirely sure what the "Prophecy" part of the book is about. The story starts with a funeral. Bam! There it is. And now we're jumping into the story. Lia's already started to notice some weird things when the book starts, and she's already in a pretty serious relationship with a guy. While I was grateful to be spared the "I like him, does he like me?" part of the book, the quick start made me feel disconnected with the story. Lia already had so many opinions about things, and I didn't know how she had developed those opinions. Yup. You read that right. Perhaps one of the reasons I didn't get it is because it was too well written. While I was reading this you could have told me that it was written in the 1800s and I probably would have believed you. The thing is I don't like books written in the 1800s. The main reason I'm not an English major is because I hate reading classics. Like I said, this is just a possibility, but maybe my subconcious thought this read too much like a classic despite the paranormal twist. So there are my theories. I'm not sure if any of them are correct. Perhaps #1 is correct, but not #2 or #3. Or maybe #2 and #3 are correct, but not #1. It's like one of those stupid multiple choice questions where the anwers are A) 1, B)2, C) 3, D) 1 & 2, E) 1 & 3, F) A & D. You get the drill. I did purchase the second book and plan to read it soon. Perhaps it will unveil why I feel so disquieted. I loved this first book but had some BIG problems with the second, which felt like a filler book. Still I'm planning to read the third as soon as my library gets it in. I've been unsure about reading this book hearing it's about twins who are rivals. I'm a twin and I'm really close to my sister, so I feel like I wouldn't connect with the characters if they don't like each other. Without spoiling anything, is that what their relationship was like? Did they not like each other from the start? Oh yeah. One of the twins is REALLY evil. They are pretty much arch enemies, though they "pretend" to like each other for parts of the book.